How do I install a plug-in into Photoshop? 1. Download the plug-in from the free trials page. 1. Simply find the plug-in on your hard drive and drag it to the Trash/Recycle Bin. Here's where to find the plug-in on ﻿Macintosh﻿ and on Windows. 2. Quit and restart Photoshop. What is a plug-in filter? A plug-in adds a new feature to a program. Photoshop, Paint Shop Pro, and some other popular paint software can accept plug-ins. Flaming Pear makes plug-ins that work with your paint software. They create complex effects too difficult to do by hand. Plug-ins are useless by themselves; they can only work together with a host program like Photoshop. Plug-ins that directly change pictures this way are called "filters." 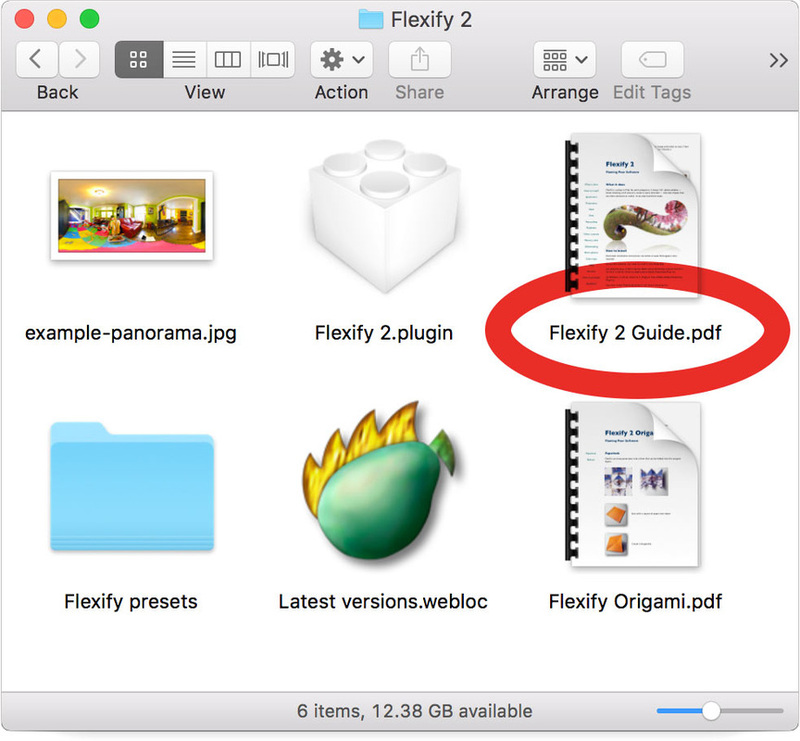 There are other types of plug-ins too; they do things like read and write unusual file formats, or talk to a scanner. How do I try-and-buy the software? Download the software from the free trials page . ​Test it and see if you like it. Then click here to order. You will get unlocking codes in an email titled "Your Paddle.com Order." From within Photoshop, start the plug-in. Click its "register" button and type in the code. Photoshop won't open the presets. Click “load preset” button. It’s the one with a disc and a red triangle. A file picker will appear. Open any preset file. What do I do with .zip and .dmg files? The software has been ‘compressed’ so it downloads faster. So you need to decompress it before it can be used. Windows files are in ".zip" format. You can open them with Windows Explorer, or decompress them with WinZip's free demo. Macintosh files are in “.dmg” format. These are disk images and automatically appear as little hard drives on the desktop. I'm having trouble with my order. Your registration code(s) will come in an email after you complete your checkout. For concerns about your order, or technical problems with the software, just ask us . Mac: select the plugin in the Finder and you’ll see the version number in the Get Info window. Windows: The version number is in the plugin's filename. For example, LunarCell-130 is version 1.30. Find the old version of the plug-in on your hard drive and drag it to the Trash/Recycle Bin. Replace it with the new version of the plug-in. You need only replace the plug-in file itself; you don't have to replace the documentation and the presets. Where do I type in the registration code? What’s the End User License Agreement (EULA)? ​You can find our EULA here. I lost my plug-in. ​Can I get a replacement? Yes! You can download the software again for free anytime here . The plug-ins know that you’re already registered. Do the plug-ins work with Photoshop CC 2017? Yes they do. Mac plug-ins will work back to CS5. The Windows plug-ins include a 32-bit version that works with even earlier Photoshops. The plug-in is greyed out in the Filters menu. The plugins only work on RGB-mode images. If you are using indexed color or CMYK color, just convert the image to RGB mode. Use Image > Mode > RGB Color. Make sure the active layer is visible. Make sure the active layer is not locked. Make sure the active layer is not text or vectors. Make sure that the selected area is not completely transparent. If it is, paint in some neutral color first. The plug-in doesn’t appear at all in the Filters menu. Photoshop has not yet been restarted. You have an old version of the plug-in. Replace it with the current version from here. You have a Windows computer, but downloaded the Mac version, or vice versa. You downloaded the correct thing but didn't expand open the .zip file / open the .dmg file. You have two copies of Photoshop on your computer. The plug-in is correctly installed in one, but you've launched the other. You have two different versions of the same plug-in installed. One of them is old and incompatible; Photoshop is trying to use that one and ignoring the good one. Only some of the plugins appear in Photoshop's menus. Where are the rest? If you have several dozen plugins installed, Photoshop may reorganize them in the Filter menu. Any plugins that don't appear where you expect them will probably be under the Other... submenu. The result is blank – all black or all white. Your starting image is blank, and most plug-ins cannot make a picture from nothing. Start with a picture that shows something. The sliders are set to extreme values that obliterate the image. Click the dice a few times. The layer mask is active, and it’s featureless. Go to the Layers palette and switch out of the mask and into the actual image. You may have double-clicked on the plug-in, or tried opening it with File > Open. Those are only for opening pictures. It fails because a plug-in isn’t a picture. Instead, you need to ‘install’ the plug-in, restart Photoshop, and then look in Photoshop’s menus under Filter > Flaming Pear. Here’s how to install a plug-in under Macintosh or Windows. ​To use the plug-ins on Mac, you need to be using at least OS X 10.8 or later. ​The manual’s in the folder with the plug-in. What do all the controls do? On Windows, use Start > Find Files and Folders. How do I get the ripple in Flood? 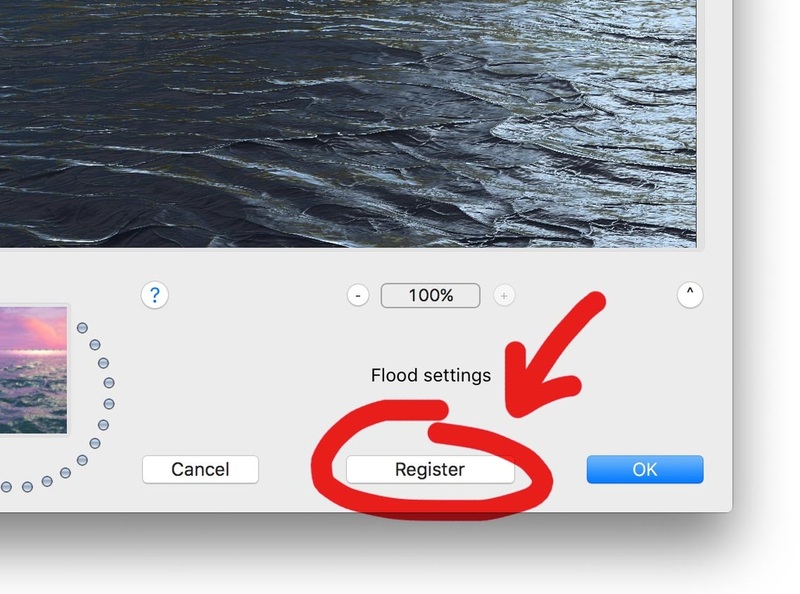 Left-click (don’t drag) on the water where you want the ripple to be. Then set Size, Height, and Undulation to non-zero values. Can Flexify help remove a tripod from a panorama? Yes! Flexify has a special zenith-and-nadir mode just for this. Do you make other apps? Hue TV for iOS, which sends colors from video to your LED lights. Desktop TV for Hue, an OS X app that sends colors from your webcam or monitor to LED lights. Scintillator for iOS, a lighting-animation designer for Philips Hue, LIFX, Lightify, and Avea. Flood for iOS, a simplified version of the plug-in. Where are the app privacy policies? Isn’t “flaming pears” a dessert? How do I contact Flaming Pear with my questions?